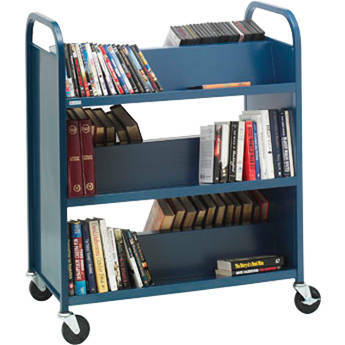 Made from 25 to 35 percent recycled steel; the environmentally friendly, heavy-duty Bretford V336-GM Booktruck makes it simple to sort, stack & retrieve books from both sides of this steel cart with its six slanted shelves that can readily hold volumes of books and other reference materials for your convenience. Made from "prime" steel for heavy duty support, this booktruck has six slanted steel shelves that can support volumes of books and reference materials. Made from 25 to 35 percent recycled steel, the powder painted booktruck is essentially environmentally friendly. The unit comes already assembled; the only thing you need to do is to add the caster wheels. Shelf Sizes 36 x 6.75"
Dimensions (WxHxD) 37 x 42 x 18"
Box Dimensions (LxWxH) 43.0 x 36.0 x 18.0"
6-Shelf Heavy-Duty Steel Booktruck (Gray Mist) is rated 5.0 out of 5 by 1. Rated 5 out of 5 by Anonymous from Great Truck for Heavy Books We use the carts to store books that are used once per year instead of using shelf space. The trucks are sturdy and easily handle the weight of the books. The casters are solid and have brakes.